New growth can have inverse catalysts, wildfire for example. Taking its name from the incendiary tool used in forest-maintenance practices of prescribed burns, Driptorch is a weekend art show in Thomasville, Georgia, with a mission to further germinate the town’s vibrant and growing cultural life. For three days in November the second and third floors of the downtown historic Hollybrook Building will be transformed into gallery space featuring five national and international contemporary artists working in the Southeast. 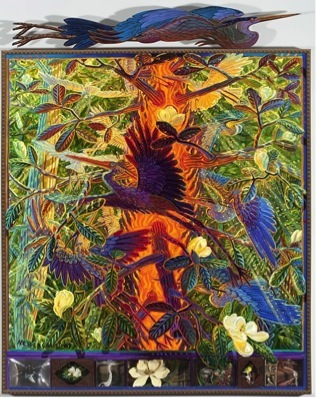 Organized by Thomasville-based artist John Gleason, Driptorch is an independent project conceived to coincide with and compliment the Plantation Wildlife Arts Festival, a time-honored Thomasville tradition that celebrates wildlife and plantation sporting art. The 2014 exhibiting Driptorch artists are Sarah Emerson, Mark Messersmith, Mary Engel, Lilian Garcia-Roig and Marcus Kenney. In diverse ways their works explore landscape and the animal kingdom as point of departure and uniting factor. Sarah Emerson is an artist based in Atlanta, Georgia. Her paintings and installations present viewers with highly stylized versions of nature that combine geometric patterns and mythic archetypes to examine contemporary landscape. She uses the camouflage of beautiful colors combined with a deliberate composition to explore themes that reflect on the fragility of life, the futility of earthly pleasures, and the disintegration of our natural landscape. 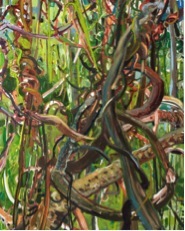 Mark Messersmith, Heights of Summer, oil and mixed media, 82×65 in. 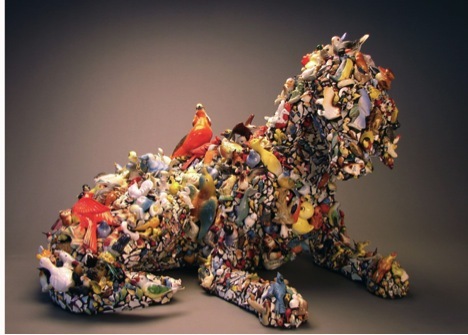 Mary Engel, Bird Dog, mixed media, ceramic, 21 x 30 x 20 in. Originally from rural Louisiana, Marcus Kenney has lived in Savannah Georgia for the last 15 years. He works in many mediums including collage, sculpture, paint, photography and installation. Consumerism, environmentalism and social injustice are issues frequently explored in his work. Blending humor and the macabre, his 2D and 3D works reveal nature as both beautiful and fierce. Lilian Garcia-Roig, oil on canvas, 60×48 in. Driptorch will run November 21 – 23, 2014 with gallery hours 10 am to 6 pm. The Driptorch entrance will be between the downtown shops “At Home” and “Mary Madison Boutique” at 110 South Broad Street, Thomasville, Georgia. Please join the artists for an opening reception and gallery talk on Saturday morning, November 22 at 10:30 am. Visit www.driptorch.net and https://www.facebook.com/DriptorchThomasville for more information.